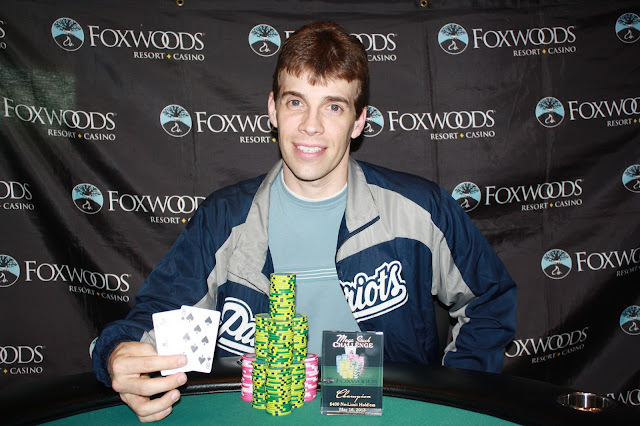 After a long heads up battle, Fred Paradis finally eliminated Mark Perry with a fortunate flop. Fred flopped trips with his [8s][6c] on a [8d][Kc][8c] board, and Mark had A-K. No king fell on the [4h] turn and [4s] river, and Fred's full house would be 1st place for him. He will earn $20,176 for his efforts. Congratulations, Fred! 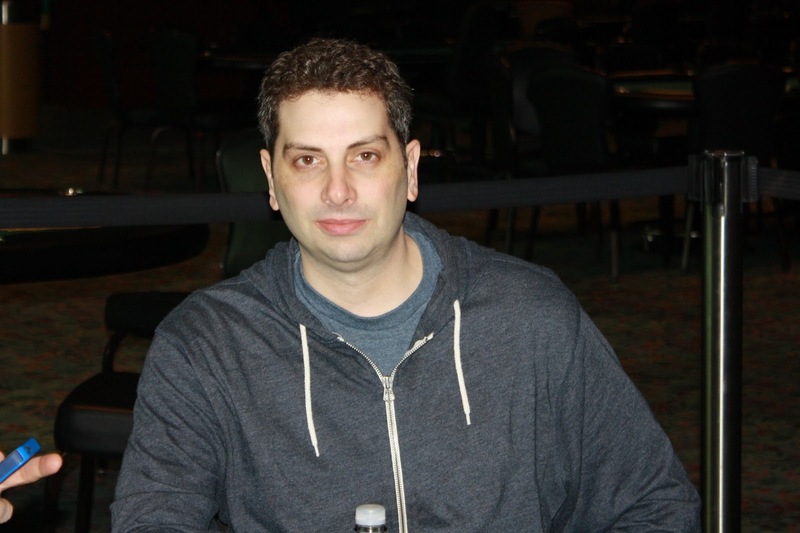 Mark Perry had his work cut out for him when he entered heads up play against Fred Paradis at an eight to one chip disadvantage. The two traded small pots back and forth, but Mark finally found a double up. On a [3s][8d][9s] flop, the two got all in with top pair. Fred had [9c][7d] but Mark had [Js][9d]. The turn was the [Jc], giving Mark two pair but actually giving Fred four outs to the straight rather than 3 outs to two pair. The river was the case [Jd], giving Mark the winning full house and the double up. 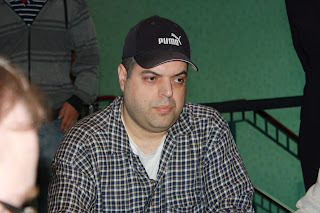 On a [Qs][Ts][6d][Js] board, Soukha pushed all in with king jack (no spade) and was called by Fred Paradis who held [Ks][Kh]. Soukha was looking for one of the two remaining jacks for the win or a non-spade ace or nine to chop the pot. 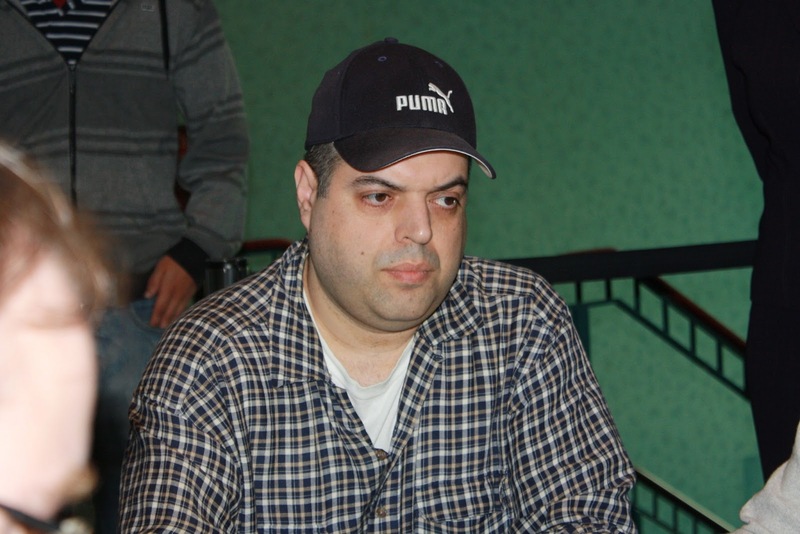 The [3h] was not what he was looking for, however, but Soukha is $9,002 richer after this final table appearance. 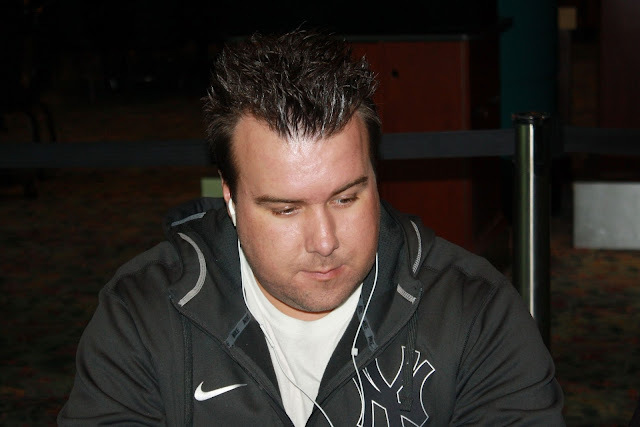 Glen Thompson was all in preflop holding [Kc][Jd] and ran into [As][Ac] of chip leader Fred Paradis. The [6h][3h][Ks] flop gave Glen some hope, but the [6c] turn erased a few of his outs. When the river fell [4c], Fred raked in the pot and Glen headed to the payout desk to collect his $6,603 payout. The 4 remaining players at the $400 Mega Stack final table are now on a 10 minute break. The tournament staff will be coloring up and racing off the 1,000 chips. When they return, the blinds will be 15,000/30,000 with a 5,000 ante. 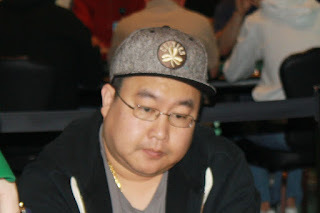 Soukha Kachittavong opened the pot with a raise to 65,000 before Fred Paradis 3-bet. Steven Brackesy then cold 4-bet all in. Action folded back to Soukha who pondered his decision before releasing his hand, and Fred made the quick call. Steven held pocket kings and would need to dodge a two-outer as Fred held pocket sevens. The 8-4-2 flop was safe for Steven, but one of the two remaining sevens fell on the turn to put Fred in front. 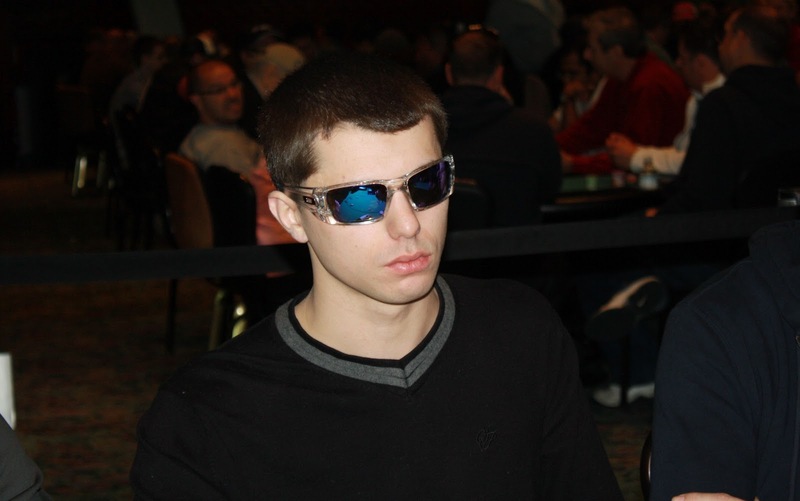 No king fell on the river, so Steven will have to settle for $4,936 for his 5th place finish. In two successive hands, Hermenegildo Trillo lost all of his chips. On the first hand, he doubled up Mark Perry. 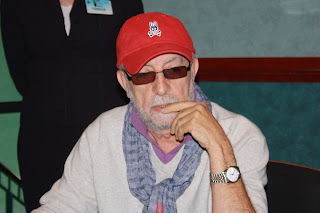 On the second hand, Hermenegildo pushed all in from the button with [Ah][6d] and Fred Paradis pushed all in over the top from the small blind holding [Qd][Qc]. The board fell [Ks][3h][Jc][9d][9c], and Hermenegildo was sent to the rail in 6th place, good for $3,748. Kevin Hunt was all in preflop holding [Ac][9d] and was called by Glen Thompson who held [Qd][Qc]. The board was no help for Kevin when it fell [Th][6h][4d][3d][2c], and he was sent to the rail in 7th place, good for $2,894. Mark Anderson had not made much noise at this final table, and he finally found a spot to get the last of his chips in when he found king queen. Unfortunately, Hermenegildo Trillo had picked up another hand and his pocket kings were a large favorite. The case king arrived on the turn to leave Mark with no outs, and the queen on the river punctuated his exit in 8th place. Mark will earn $2,274 for his efforts. Kevin Hunt moved all in preflop for approximately 350,000 and was snap called by Hermenegildo Trillo. All folded to Mark Perry in the big blind, who tanked for quite some time before mucking. 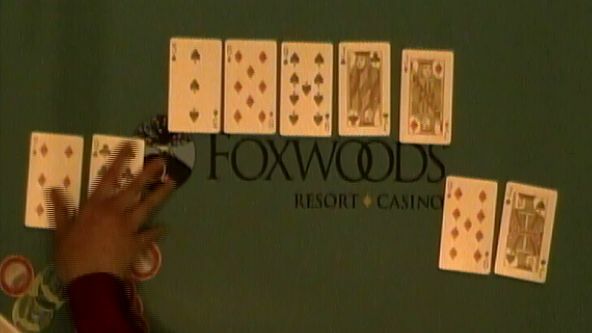 Hermenegildo answered by indeed showing him two aces, which were in front of Kevin's two jacks. Amazingly, the board rolled off four spades to give Kevin the winning flush and letting him survive the all in. On the very next hand after Soukha Kachittavong doubled up Mark Perry, Soukha was at it again. This time he snap called Sheila Raine's all in, holding pocket kings against Sheila's ace jack. 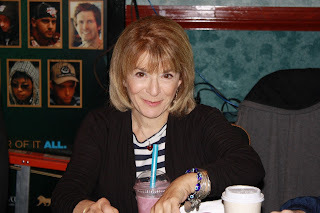 No ace materialized, so Sheila will have to settle for 8th place, good for $1,821. Mark Perry was all in preflop holding pocket fives against the A-Q of Soukha Kachittavong. 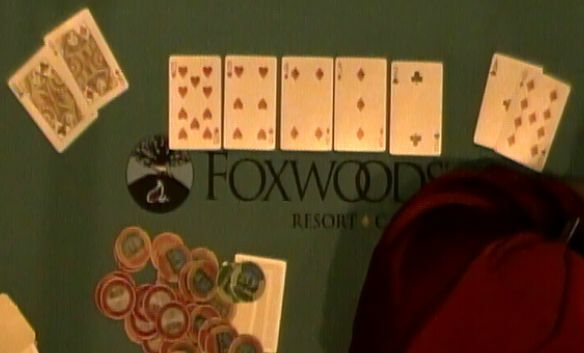 A five on the flop left Soukha drawing dead, and Mark doubled up to about 250,000. With the blinds at 10,000/20,000, Mark still has some work to do. It was an unfortunate cooler for Hermenegildo Trillo as he ran his [Ac][Qc] into the [Ah][Ad] of Sheila Raine. Sheila had no sweat at all as the board brought no help to Hermenegildo, and she was able to double up to around 500,000. Leonidas Gialelis pushed his last 213,000 chips into the middle with pocket tens and was called by Hermenegildo Trillo on his direct left holding pocket queens. Though Leonidas flopped a backdoor straight draw, Hermenegildo flopped top set, and his hand held through the turn and river. 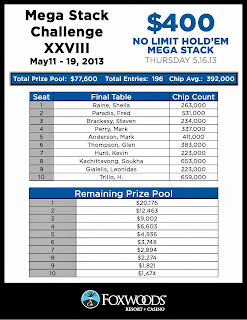 Leonidas will exit this tournament in 10th place, good for $1,474. $400 Mega Stack Final Table has begun! Cards are in the air for Day 2 of the $400 Mega Stack. 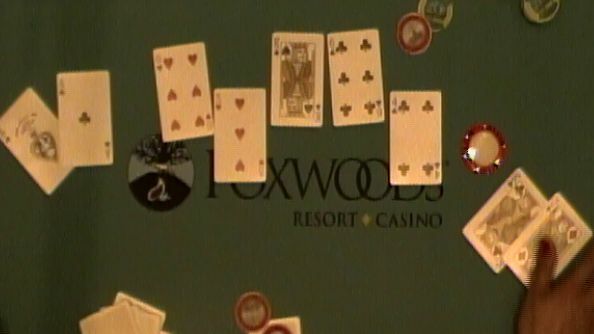 You can watch the final table stream live at www.FoxwoodsLive.com as the final 10 fight for the title and the $20,176 first place prize. 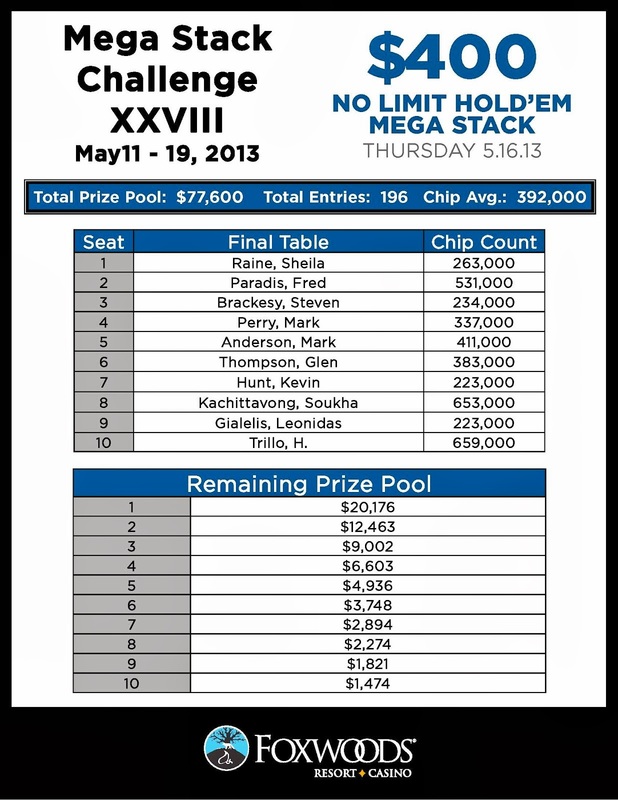 With the elimination of our 11th place finisher, the final table has been reached. The tournament staff has paused the clock with 27 minutes and 18 seconds left in the lever, and the final 10 will return tomorrow at 12pm EST to play the final table. The dozen players that remain in today's $400 Mega Stack tournament are now on their last break of the night. They will return and play the 6,000/12,000 level before bagging up their chips and completing play for the night. Whoever remains will return tomorrow at 12pm EST to play down to a winner.